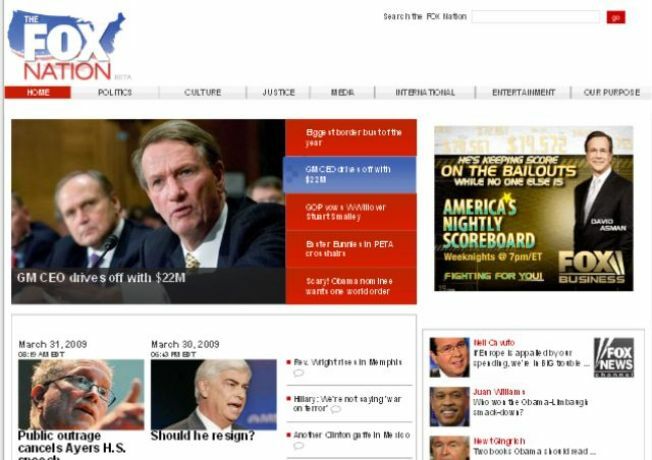 Fox launched its new Web site, TheFoxNation.com, Monday in an attempt to draw more online visitors. Big-bucks media juggernaut Fox News launched news blog TheFoxNation.com today in an effort to blast Rupert Murdoch's News Corp empire, which already owns MySpace.com, even farther into the Internet universe. The site bills itself as having a decidedly pro-American slant, saying its target audience is "people who believe in the United States of America and its ideals, as expressed in the Constitution, the Declaration of Independence, and the Emancipation Proclamation," according to the site. "This is a place for people who believe we live in a great country, a welcoming refuge for legal immigrants who want to contribute their talent and abilities to make our way of life even greater," the site reads. The Drudge Report and Huffington Post-style site aggregates political, cultural and entertainment news from sources around the country. It will also feature videos and columns from popular Fox News television personalities like Greta Van Susteren, Sean Hannity and Bill O'Reilly, as the TV powerhouse attempts to integrate its network success with online viewership. "In simple terms, it's kind of Drudge meets Huffington Post," Joel Cheatwood, senior vice president at Fox News Channel, told USA Today. "It's a chance for us to leverage some of the incredible opinion talent that we have, and really tap into a fan base that I think is more passionate than just about any other fan base in media," Cheatwood said. Fox regularly dominates television ratings, more than doubling both CNN and MSNBC's viewership last month. But online, CNN and MSNBC both top Fox News's site, which had a meager 16 million visitors last month - compared to the 35 million apiece raked in by both other networks.